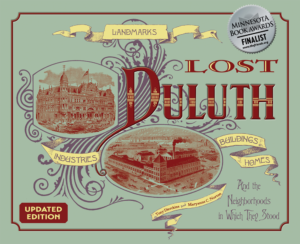 In the wake of the financial panic of 1857, German immigrants H. S. Burk, Gilbert Falconer, Harvey Fargo, and J. Gottlieb Busch found themselves unemployed in Portland Township, now part of Duluth’s East Hillside. Staked by pioneer Sidney Luce, the four built a brewery along a creek feeding Lake Superior and, using skills Busch picked up during his work as a cooper, began making beer for the small local population. The Luce/Busch Brewery (sometimes referred to as J. G. Busch & Co.) was the first in the Zenith City, but more would follow. Brewers that came and went during Duluth’s early years as a city included Gustave Kiene (1869–1876), Kreimer Brothers (1872–1874), and Camahl & Busse (1874–1875). 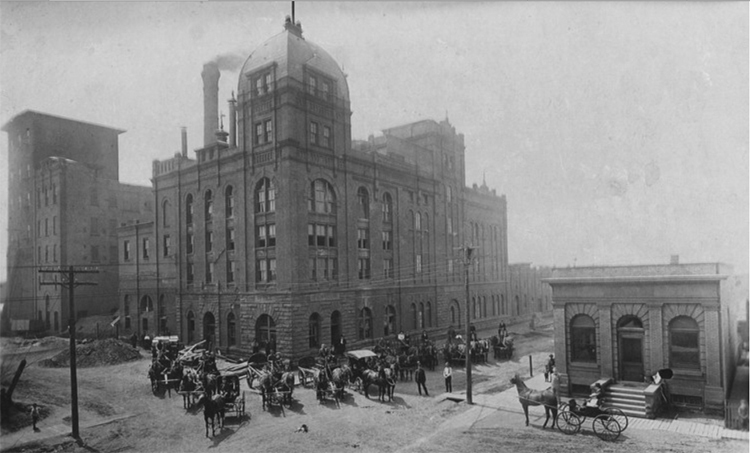 The Luce/Busch Brewery barely survived the early 1860s. In 1865, Luce sold the brewery to Nicholas Decker. Under Decker the brewery was sometimes called the Pioneer Brewery or the Vermillion Brewery. Decker died in 1875, and the next year his family leased the brewery to Michael Fink. In 1881 Fink built the Lake Superior Brewery along Superior Street, after which Duluth’s pioneer brewery was operated by Decker Brothers (1882–1884), and W. Franke & Co. (1884–1885). In 1883 August Fitger, Fink’s brewmaster since 1882, purchased a half interest in Fink’s brewery. Percy Anneke purchased the other half in 1885, and he and Fitger took over as A. Fitger & Co. Lake Superior Brewery. Fitger and Anneke had much greater success than their predecessors. The company grew throughout the late nineteenth and early twentieth centuries, adding buildings and employees to their facility at 600 East Superior Street as the years progressed. In 1890 the brewery installed Minnesota’s first ice machine. Sales continued to grow, and the brewery continued to expand. That growth stopped abruptly in 1918, when early Prohibition in Duluth shut down beer manufacturing and sales. Fitger and Anneke scrabbled to keep the brewery operational and Duluthians employed. They leased their Brewery Saloon to bartender Joseph Wisocki. Wisocki would later rename the saloon the Pickwick after a near-beer made by Fitger’s. During Prohibition, Fitger’s made candy, distributed cigars, and manufactured non-alcoholic beverages. Their most popular brand was Silver Spray, which mixed well with the bootleg liquor and was sold in thirty-three states. 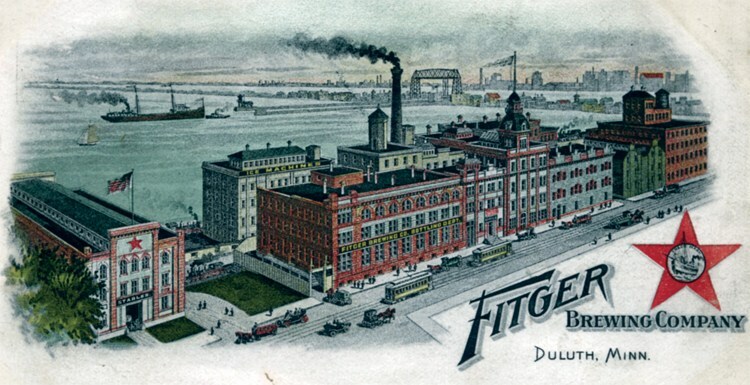 Fitger’s survived Prohibition to become a major regional brewery, but they couldn’t survive the post-war consolidation and expansion of breweries such as Miller and Budweiser. Further pressure from the Minnesota Pollution Control Agency and the Minnesota Department of Transportation forced the brewery’s closure on September 19, 1972. Fitger’s had no serious competition in Duluth until 1895, when brewmaster Reiner Hoch and Charles Meeske established the Duluth Brewing & Malting Company. In 1896 Hoch and Meeske began construction on a six-story brick brewery at Twenty-Ninth Avenue West and Helm Street. The massive building featured arched windows and at least three towers and was trimmed with brownstone quarried at Fond du Lac. Duluth Brewing & Malting was one of the few breweries in the country which had its own malting plant (the only other one in Minnesota was at St. Paul’s Hamm’s Brewery). Most other breweries purchased malt for their beers and lagers. Duluth Brewing & Malting’s early flagship beers included Moose Brand Lager (and its low-alcohol cousin, Our Tame Moose) and Rex. During Prohibition, Duluth Brewing & Malting changed its name to The Sobriety Company and manufactured near beer and Lovit brand soft drinks, but it wasn’t enough to keep the company going. In 1930 Fitger’s purchased the Lovit brand along with the rights to all the Duluth Brewing & Malting’s beer labels, and following Prohibition Rex became one of Fitger’s most popular labels. Competition from larger breweries and the Minnesota Highway Department’s plans to extend Interstate 35 through Duluth forced Duluth Brewing & Malting’s closure in 1966. While most of the brewery was demolished, the office, bottling facility, and warehouse still stand. Over the decades since it ceased operation, many have come to believe that Duluth’s People’s Brewing Company was born of socialist ideas brought to the region by eastern European immigrants to “resist the evils of capitalism”—in fact, that’s what was believed when we first wrote about Duluth’s brewing history. Recent research indicates that that was not the case. Pat Doran, Frank G. Sandstedt, Michael J. Gleeson, and other investors pressed on without Toelle, building a brewery at 4230 West Second Street. Sections of the facility stood five stories high and were faced with brick and Bedford stone trim. It first produced beer in June 1908 with Sandstedt as president and Ernest A. Koenig as brewmaster. The brewery operated from 1908 until 1920—and paid dividends to its shareholders each year—when Prohibition stopped production of beer. It bottled and distributed cereal beverages and soft drinks, but closed before Prohibition ended. People’s resumed beer production in 1933 when Prohibition was repealed. Carl O. Hanson reorganized the brewery and began touting its beer as being made with “Crystal Clear-Chemically Pure Lake Superior Water.” Some of People’s better-known brands included Stag, Olde English 600 (a malt liquor originally labeled Ruff’s Stout), and Regal Supreme, the brewery’s most popular beer. The Regal Supreme label featured a likeness of Duluth’s namesake, Daniel Greysolon Sieur du Luht, and was advertised with a print campaign describing du Luht’s exploits in the Western Lake Superior region, including the time he had two Ojibwe executed for the murder of two Frenchmen. In the 1950s, Duluth was the only city in Minnesota operating three breweries—until People’s closed in 1957. Most of the building was razed in about 1975 with the exception of a two-story section, occupied today by the Brock White Company, and the bottling works, now a Serv-Pro franchise. Commercial brewing in Duluth was revived in 1994 with the opening of the Lake Superior Brewing Company, which was first located within the repurposed Fitger’s Brewery Complex. Since then several brew pubs and microbreweries have found success in Duluth, including Fitger’s Brewhouse inside the Fitger’s complex, Dubrue (2011–2014), Dubh Linn Irish Brew Pub, Blacklist Artisan Ales, the Canal Park Brewing Company, Bent Paddle Brewing Company, Hoops Brewing, Ursa Minor Brewing Company, and Carmody Irish Pub & Brewing, established by Eddie Gleeson, a grandson of People’s Brewing co-founder Micheal J. Gleeson.